Where Will Pope Francis Be When He Visits the US, and What Will He Be Talking About In Those Cities? 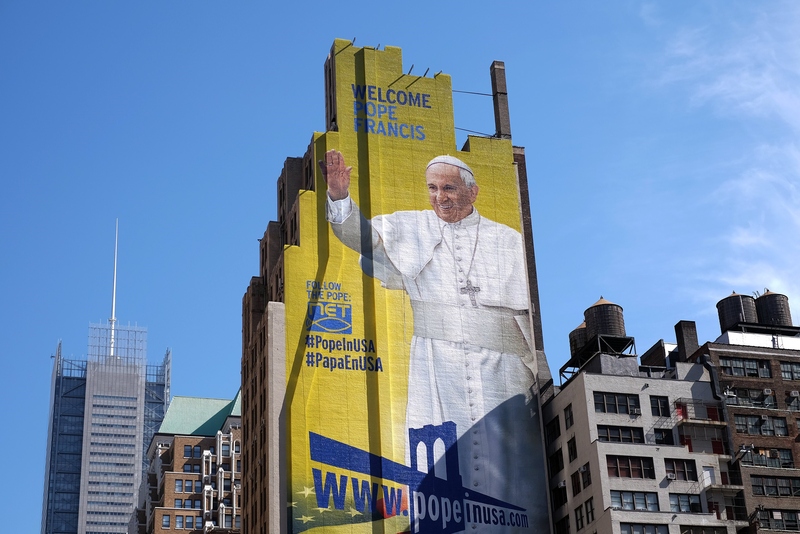 Millions across the northeastern United States are preparing for the arrival of Pope Francis, the popular pontiff who's making a historic week-long trip to America next week. Francis is slated to hit three major U.S. cities — Washington, D.C., New York, and Philadelphia — where he'll dispense his godly wisdom, gentle spirit, and progressive values. Given the timing of Francis' inaugural trip to America, U.S. Catholics and politicians alike are keeping a close eye on the pontiff, who's anti-capitalist and environmental screeds have already ticked off some conservative lawmakers. The papal plane hasn't even departed for this land of free enterprise yet and already America is on edge about the leader of the Roman Catholic Church. On Friday, U.S. Rep. Paul Gosar (R-Ariz.), a Catholic, published an editorial on conservative website Town Hall explaining why he's boycotting Francis' Congress address next week. "[W]hen the Pope chooses to act and talk like a leftist politician, then he can expect to be treated like one," Gosar wrote, lambasting the pontiff for choosing to talk about climate change over "violent Islam" and "standard Christian theology." Former Speaker of the House Newt Gingrich, a Catholic convert, penned a joint editorial with former U.S. ambassador to the Vatican, Jim Nicholson, condemning the pontiff for his strong rhetoric against capitalism. "You will find a free enterprise system that has lifted millions from poverty and has made America unique among nations," Gingrich and Nicholson wrote. "Though it has flaws, our economic system is not some savage jungle." Of course, others are taking a more positive approach to Francis' upcoming visit. A Catholic priest in Pennsylvania, for example, built a replica of the Vatican entirely out of Legos. The massive Lego creation is currently on display at the Franklin Institute in Philadelphia. Here's where Francis is going to be next week, what he will be talking about, and what he should be talking about. Francis will touch down at Joint Base Andrews, just outside of Washington, D.C., on Tuesday afternoon. During his two days in Washington, he's scheduled to meet with President Obama at the White House, hold a papal parade along the National Mall, and, of course, address a joint session of Congress. Next Thursday's address to Congress is perhaps the most anticipated event of his U.S. visit. The crux of his speech is climate change — not a surprise, given the pontiff released a ground-breaking encyclical last June on the harmful effects of global warming and the need for climate justice. However, we could also except a little bit of the pope's economic justice side to come out, considering that Francis has linked climate change to the global economy and our materialist greed. But will the pope also address the issues of immigration and racial justice? Francis has been overwhelmingly in favor of immigration reform in both the United States and Europe — he recently called on European Catholic churches to take in refugee families — and so it's likely the pontiff may throw some shade at the conservatives in America (ahem, Donald Trump) looking to close the borders and mass deport undocumented citizens. Discussion of racial justice and Black Lives Matter seems less likely, but the first Latin-American pope is, of course, ever-sympathetic to the cause of abolishing systemic discrimination. After landing in New York City on Thursday evening, Francis will be conducting evening prayer at the famed St. Patrick's Cathedral. On Friday morning, the pontiff will address the United Nations General Assembly — another anticipated address that's sure to have an impact — and take a ride through Central Park. He will end the day with a Mass at Madison Square Garden. According to a statement from the United Nations, Francis is also slated to hold bilateral meetings on Friday with the UN secretary-general and the president of the general assembly. Francis' specific message to the United Nations has been kept under wraps, but the peacekeeping organization has stated that the pontiff will surely touch upon human dignity. Here, we can except Francis to expand on immigration reform worldwide, in light of Europe's ongoing refugee crisis. Catholic News Service also predicted that Francis will discuss efforts to help the poor, particularly in developing nations, and continue his environment efforts. What would we love to see from Francis when he addresses the United Nations? Considering his meeting coincides with the 20th anniversary of the United Nations Fourth World Conference on Women, which declared that women's rights are human rights, we would like His Holiness to address the status of women worldwide. Yes, this include the need for reproductive rights — something the Catholic Church still opposes — as well as education for girls and women, and an end to sexual violence. Will you stand up for the women of the world, Francis? Francis is ending his U.S. trip in Philadelphia, where the World Meeting of Families is being held. Here, Francis will not only preside over Mass and visit some of the historic sites, but he'll also meet with inmates at the Curran-Fromhold Correctional Facility. Is a talk or two about America's mass incarceration also on his agenda? The World Meeting of the Families will be adhering to Catholic dogma, but this could also be a time where Francis makes good on some of his progressive remarks about LGBT Catholics and their families. Will Francis step up, promote his "Who am I to judge?" ideology, and advocate for the equal rights of gay, lesbian, bisexual, and transgender people? We hope so.